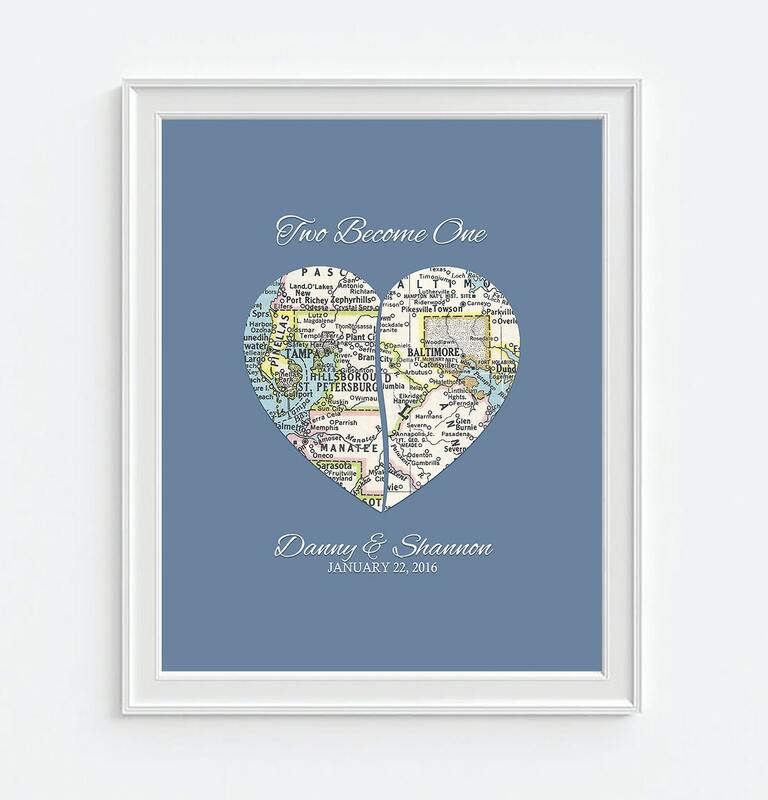 This makes a perfect wedding gift, anniversary gift, valentine's gift, or special print for your loved one. We scan REAL MAPS (no generic photoshop here!) and look for maps with color and character, between 5 and 30 years old, which means that there may be some slight blemishes, smudges or even bleed-thru. We use a variety of maps: Roadmaps evoke memories of riding in the back of the station wagon on a road trip as a kid, while Atlases show amazing topography, and Vintage maps shop charming color and fonts. -Choose your COLOR from 12 retro colors. Upon checkout, in "Notes to Seller," Simply give the NAMES, DATE, CITIES, FONT you want on this print. This unframed print fits in a standard size frame. All of our prints are printed by a professional printer using archival inks and quality Kodak Endura luster photo paper. Items are shipped in reinforced nonbendable mailers directly to you. This style is also available as an instant download that you can print on your personal printer and frame- no waiting! Check it out in our "Printables" section. Genius concept, disappointing product. I assumed I'd receive a high-quality product. I assumed incorrectly. To my dismay, this item was printed on standard photo printer paper. The map, the cornerstone of this product, wasn't even a high-res graphic. Honestly, someone with a basic knowledge of PowerPoint could create this item. Considering what I paid ($55 for an 11"x 14" print), I expected MUCH more. I expected a high-quality map on professional grade paper. Vendor communication was good, delivery was very fast and packaging was excellent. When I contacted the vendor with my concerns about the final product, I was told returns weren't an option due to the customization. In my opinion the value of this product is significantly overpriced. Given the quality of final product, $15-20 is more realistic than what I paid. This canvas exceeded my expectations....it is simply amazing! I am delighted with the finished product and ever so grateful to Shannon for working thru a change in date mid-production. I highly recommend this to one and all! A small miscommunication issue but all was rectified beautifully. Very professional and my poster looks fantastic. Thank you! !